The PFL 2019 roster continues to take shape with the addition of a pair of UFC veterans, including undefeated light heavyweight Jordan Johnson. The Professional Fighters league is continuing to unveil its roster for the upcoming PFL 2019 season. And among the most recent additions are a couple of UFC veterans. Plus a handful of returning names. PFL officials announced the news in a press release on Thursday. 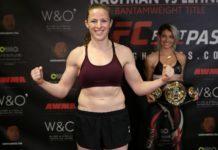 Among the standouts, undefeated UFC light heavyweight Jordan Johnson (10-0), who won four straight fights under the UFC banner, but could not come to terms on a new deal with the promotion. The shot at a million dollars in the PFL, quite bluntly, will likely represent more money than he could have made through another UFC deal anyway. 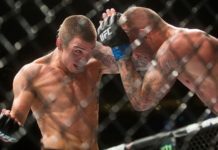 Johnson began his pro career in 2014, and joined the UFC in 2017, quickly rattling off a number of decision wins before submitting Adam Yandiev in his final fight with the company at UFC Moscow. That fight marked Johnson’s middleweight debut, but he’ll be back to light heavyweight with the PFL. Also joining the Professional Fighters League in 2019, UFC and Bellator MMA vet David Michaud (15-4). Among his fifteen wins as a pro, thirteen have come via stoppage. Michaud fought for the UFC from 2014-2015, going 1-2 with the promotion. He’ll enter the PFL 2019 season on a three fight win streak, with his most recent win coming under the LFA banner. Other new fighters joining the league for 2019 are welterweight Zane Kamaka (13-3), a cousin of PFL standout Ray Cooper III, and featherweight Luis Rafael Laurentino. Laurentino has a mind-boggling pro record of 33-1. A good number of those opponents boast sub-.500 records, but his past two victories have come against Carlisson Diego Dos Santos (13-5) and Cleverson Silva (11-3). Lightweight Nate Andrews (15-1) rides a nine-fight win streak into the PFL 2019 season, with all victories coming by stoppage. Australia’s Ben Edwards (4-0), a heavyweight, has the least MMA experience of the bunch, but had a successful kickboxing career, setting the record for the fastest kickboxing tournament win in K-1 history: three first-round knockouts across a grand total of 3:28. Russia’s Denis Goltsov (22-5) also joins the heavyweight division. 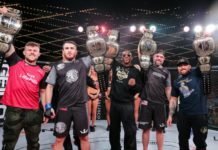 Returning to the PFL roster for a second season, meanwhile, are Smealinho Rama (light heavyweight, former WSOF heavyweight champ), Alex Nicholson (PFL 2018 heavyweight semi-finalist), Kelvin Tiller (heavyweight), Sadibou Sy (welterweight), Chris Wade (PFL 2018 lightweight semi-finalist), and Andre Harrison (PFL 2018 featherweight semi-finalist).